Rose Cottage01263 715779work01603 870304fax Self-cateringA traditional exterior with a fabulous modern interior, this super cottage is located in Stiffkey on the north Norfolk coast, which is a designated Area of Outstanding Natural Beauty. With plenty of space inside to relax and unwind the cottage is surrounded by wild flower planting, including a wild flower meadow to the rear. The famous Stiffkey Marshes are just a short walk away and the village has a well renowned pub and a super coffee shop/delicatessen - the place to go for your daily supplies and some of the best chocolate brownies in Norfolk!. If you want to leave the car behind, catch the Coasthopper bus service from the village and explore the delightful and the quirky of Norfolk's best coastal villages by the sea. • Parking: Ample parking. Please note that the driveway is unsuitable for campervans. Rose Cottage offers weekly bookings starting on Saturday. 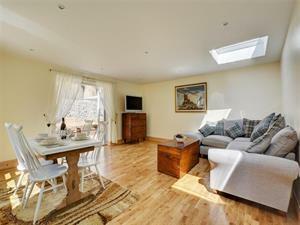 A traditional exterior with a fabulous modern interior, this super cottage is located in Stiffkey on the north Norfolk coast, which is a designated Area of Outstanding Natural Beauty. With plenty of space inside to relax and unwind the cottage is surrounded by wild flower planting, including a wild flower meadow to the rear. The famous Stiffkey Marshes are just a short walk away and the village has a well renowned pub and a super coffee shop/delicatessen - the place to go for your daily supplies and some of the best chocolate brownies in Norfolk!. If you want to leave the car behind, catch the Coasthopper bus service from the village and explore the delightful and the quirky of Norfolk's best coastal villages by the sea.